The curator of the project, the architect Francesco Dal Co, has enlisted practices from all over the world: Norman Foster (UK), Terunobu Fujimori (Japan); Francesco Cellini (Italy); Andrew Berman (US); Javier Corvalan Espinola (Paraguay); Flores & Prats (Catalonia); Carla Juacaba (Brazil); Smiljan Radic Clarke (Chile); Eduardo Souto de Moura (Portugal); MAP Studio: Francesco Magnani and Traudy Pelzel (Italy); and Sean Godsell (Australia). The project expresses the theme of this biennial, chosen by its curators Yvonne Farrell and Shelley McNamara, which is “Free Space”—space for all, to be used as the individual chooses. 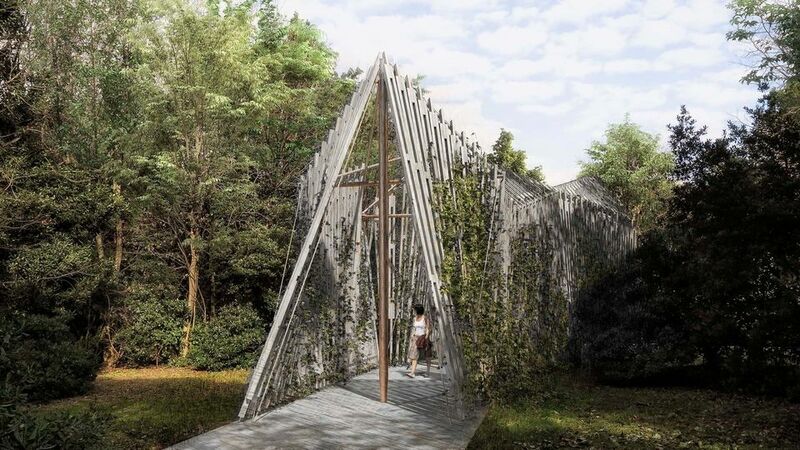 “We have decided to engage with the sphere of architecture to create a pilgrimage in the woods, a place of silence and shade, a journey and meditation in which non-believers can also take part”, Ravasi explained. The cardinal is known for his scathing comments about contemporary ecclesiastical art and design. Introducing the biennial project in the Vatican, he said that churches had “copied the styles of the past, or…worse, we have adapted to the ugliness of the new suburbs and aggressive building schemes, raising sacred edifices that are devoid of spirituality, beauty or any encounter with the new artistic and architectural languages that have been developing meanwhile”. He said that he hoped that the chapels would start a dialogue between contemporary architecture and the Church again: “A desire has emerged for a new engagement between art and faith, two worlds that were once so entwined as to be almost one but have become mutual strangers. It is a meeting path that is arduous and complicated, and still feeds on reciprocal suspicion, aversion and even fear of degeneration”. The building costs of the chapels have been sponsored by the constructors and by donors. Their future after the biennial closes on 25 November is as yet undecided.